TNPDS TN Smart Ration Card online apply and status check 2019: Tamil Nadu Electronic Public Distribution System (TNPDS) is an attempt of state government moving from manual to an automated system of working. People of Tamil Nadu can get information about how to apply for new TN smart ration card and also check ration card status. We have given direct link to apply for the TNEPDS smart ration card status check link and registration link. It has reduced the manual work and also saves the time of both departmental employees and citizens. Under the digitization program of PDS system in the state, the government is issuing new smart cards to the citizens. The old ration cards are being converted into the new smart cards so that government can have a smart control over the ration system. 2 How to check the TN smart ration card status online? 4 How to register a Complaint in TNEPDS portal? White cards- who receives extra 3kg sugar over the prescribed quota. Khaki cards- for police personnel up to the rank of inspectors. Automation of TNPDS system has increased the consumer service. Now, there are various services for the citizens such as online portal, mobile app, SMS service, Call Centres, email service, and also social media platforms like Facebook. With this portal, citizens can also know about their nearest ration shops and service centers. Add members- Citizens can add the name of a family member in the card through an online portal. Change of address- In case citizens wants to change the address they can also do so online. Family Head member change- If any citizen wants to change the name of the family head in the ration card. Remove the name of a family member- like adding the name of a family member one can also remove the name of the family member from the card. Card cancellation/ Surrender- Cancellation or surrender of the ration card can also be done through this portal. Card-related service request status- Public can also check the service request status of their card. 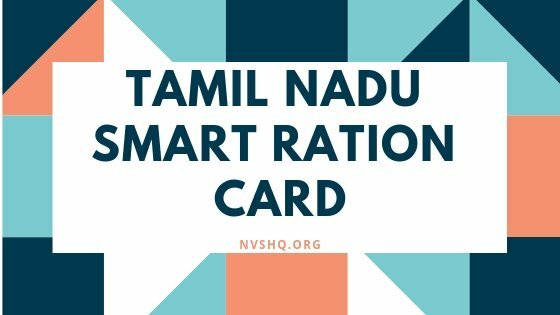 How to check the TN smart ration card status online? They need to visit the official website. They have to now open the “Smart Card Application status” link. On this page, applicants are required to enter the valid registration no. Application status will appear on the screens. In case candidates want more information then, they can contact the helpline no. Step 1- Visit the official website i.e. https://www.tnpds.gov.in/. Step 2- Click on “Smart Card Application” on the homepage of the portal. Step 3- Now, applicants have to enter all the required details like name of the family members, application no., address etc. They also have to upload the photograph of the head of the family in the prescribed format. Step 4 – At last, they have to add family member details, gas connection details and declaration and have to submit the form. Step 5 – After submission, they will receive a reference no./ application no on their registered mobile no. They have to keep this application no. safe till they get their smart ration card. With this no. they can also check the status of their application. Tamil Nadu citizens can visit their nearby Ration shop and can register through the point of sale device. Applicants are required to carry all the necessary documents with them for the registration. The state government has also launched a mobile application for this purpose. Citizens can also register through this application on their mobile phones. They do not have to visit the ration shop or registration center, especially for registration. Both Android and IOS users can download this mobile application on their mobile phones. How to register a Complaint in TNEPDS portal? In case citizens have some grievance related to the smart ration card application or any other issue, they can also register a complaint through this portal. They first have to visit the official website. Now they have to choose “Register a complaint” option provided on the left-hand side of the portal. On the complaint registration page, they have to enter the name, mobile no., email, description of the complaint and have to submit it. After successful submission of the complaint, citizens can also check the complaint status and send the feedback. For checking status and sending feedback they have to visit the same complaint page by following the aforementioned steps. Tamil Nadu automated PDS also provides an SMS service for three services viz.- To know the availability of commodity at Ration shop, to raise a complaint about billing and know the status of ration shop i.e. whether it is open or closed. There specific code for each service. Citizens have to type the code and have to send it to 9980904040 from their registered mobile no. Ques.- How many types of ration cards are available in the state? Ans.- There are four types of ration cards and citizens having any of these cards can apply for the smart card. Ques.- Who can avail the SMS services? Ans.- Only the registered citizens are entitled to avail the service. Ques.- How can raise a complaint? Ans.- Only a registered citizen can raise the complaint. Ques.- What are the benefits of a registered user? Ques.- What if one has a ration card but his/her mobile no. is not registered? Ans.- In this case, they can contact the helpdesk at 1967/1800-425-5901 and get their number registered. Ques.- If a citizen is not interested in taking PDS commodity, what can he do? Ans.- In this case, such citizens can convert their card to the “No Commodity Card”. This facility is also available on the online portal. With the digitization of all the operations of PDS, the system state has moved from a manual format to automated one and it is a great achievement. The automation of the PDS system in state facilities more transparency, more visibility and more accountability of the department towards the public. Hope you have got a good idea about the new scheme released by the TN government. If you have any question in regards to TN smart ration card application, tracking status you can ask us in the comment section below. One of our team members will help you in solving the problem. Please let me know where this card number is activated with which shop address. THE CARD NUMBER IS 12G0101910. Please help us to how to get new smart card which the address is being changed.